A generous slosh of dark rum could be added to this non-alcoholic cocktail. Mix the juice, cordial, sugar, lime juice, mint leaves and ice together. 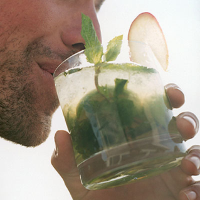 Top up with soda water and garnish with mint and an apple slice.